Gather your crew around the fire pit to swap stories from the slopes and enjoy a sweet treat. The kiddos can play Marco Polo in the heated pool while you settle in for a soothing soak in the hot tubs. Modern amenities and rustic charm make for the perfect alpine getaway. It'll be like your own family cabin. Have home-cooked comfort food away from home, thanks to a full kitchen with modern appliances. Expansive grounds and almost 400 inches of annual snowfall make this an actual winter wonderland. You won't have to go far to enjoy the slopes. Eagle Bahn Gondola 19 and Born Free Express Lift 8 are just a 4 minute walk away. You're 5 minute drive from all the excitement of downtown Vail. Take a mid-day break for a relaxing swim in the outdoor heated pool. The resort has 2 outdoor hot tubs for relaxing - test them both. Stock up on snacks, Booth Falls Trailhead is just a 10 minute drive from the resort. Grab your clubs and go. Vail Golf Club-Driving Range is just a 6 minute drive away. Nestled in the quaint Lionshead Village at the world-famous Vail Ski Resort, condominium suites at the Westwind provide a homey crash pad for you and your crew during your ultimate alpine getaway. One of two base areas at Vail, Lionshead Village will transport you to an Old European alpine community, complete with cobblestone walkways and chalet-inspired architecture. Pro tip: ask about a West-facing suite and you could be scoping out the slopes each morning over coffee on your balcony. There’s a rental shop next-door but if you brought your own gear there are ski lockers in the parking complex. Heated underground parking means you won’t have to dig out your ride after a heavy snowfall, (it also means you won’t have to brave the cold if you forget your phone charger in the car). Once everyone is bundled up and fully-outfitted just waltz outside and right up to the Eagle Bahn Gondola. Ride it to the Eagle’s Nest on the west peak of the mountain, where you can leisurely ride back down or explore other lifts and runs. Got a kiddo in need of a refresher? Drop your grom at the Vail Ski School where they’ll get personalized coaching and make friends with other little riders. The school also has several women’s groups like the Girlz On Edge clinic, led by SKI Magazine expert Deb Benson. Rendezvous with the crew for lunch on-mountain. Bistro Fourteen at the top of the Eagle Bahn has stunning views of Mount of the Holy Cross and a great kid’s menu. Feeling a bit more upscale? Head to 10th Restaurant and try their “modern alpine cuisine.” After a full day on the slopes, return to a tidy condo (yay, housekeeping!) and gather round the fireplace to discuss dinner options. Lionshead Village provides a variety of walkable eateries but don’t be surprised if the crew is craving your signature homemade shepherd’s pie – good thing there’s a fully equipped kitchen. After the carbo-loading suggest a trip to the outdoor hot tubs to soak your weary limbs (signs of an adventure-filled day) and do some stargazing. One- and two-bedroom condos are bright and clean, individually-decorated but with a consistent homey, alpine aesthetic with just the right amount of rustic charm. Spacious living areas, well appointed kitchens lend the comforts of home to your vacation rental. All two-bedrooms and many of the one-bedrooms also boast en-suite washer/dryers. Gas fireplaces and cushy couches make for a cozy and inviting space to kick back with the group – great for game nights. Got some non-skiers in your crew? No worries, they’re going to love Vail too. There’s the mountain resort classics like a tubing hill with magic carpet lift, mini-snowmobiles for the kiddos and an ice skating rink. Discover Colorado’s alpine beauty with a guided snowshoe tour put on by the Nature Discovery Center. For a unique and exciting way to explore the mountain sign up for ski-biking (part ski, part bike, fully awesome). - To make arrangements for check-in please contact the property at least 24 hours before arrival using the information on the booking confirmation. - Guests that are planning to arrive after hours must contact the property using information on the booking confirmation to receive an email with check-in instructions. - Guests will be asked to complete and return a damage waiver prior to arrival. For more details, please contact the office using the information on the reservation confirmation received after booking. Located in Eagle County, Colorado. 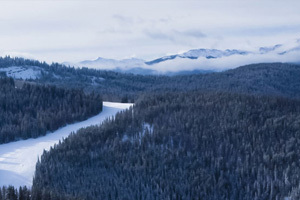 The third largest single mountain ski resort in the U.S. and featuring terrain for skiers at every level. The town of Vail was built specifically for the ski resort and the mountain is comprised of three sections: The Front Side, The Back Bowls, and Blue Sky Basin.